When I was growing up one of my favorite computer games was the Lemmings franchise. In addition to the cute characters, I really liked the game’s gameplay as it was original and challenging. While the Lemmings were quite popular in the early 1990s, Lemmings and the genre of games that it spawned kind of died out in the 1990s as you rarely see games from the genre made today. That is why I was intrigued when I found out about Molecats. Basically Molecats takes the gameplay from Lemmings of guiding creatures from the start to the finish and turns it on its head. Instead of giving the Molecats directions to make their own path through the level like Lemmings, Molecats has you manipulate the environment itself to guide them to safety. Molecats owes its inspiration to Lemmings but finds a way to modernize the gameplay into a truly original puzzle game that is a blast to play. We at Geeky Hobbies would like to thank Vidroid for the review copy of Molecats used for this review. Other than receiving a free copy of the game to review, we at Geeky Hobbies received no other compensation for this review. Receiving the review copy for free had no impact on the content of this review or the final score. As I already alluded to, the basic gameplay in Molecats is very similar to that of Lemmings. There is even a hidden Easter egg in one of the levels which references Lemmings. Basically the gameplay involves getting the Molecats from the beginning of the level to the end. While you eventually get the ability to give the Molecats basic commands (run, turn around, stop), the main way to get the Molecats to the end of the levels is to manipulate the environment itself. Each level consists of different tiles. Some tiles you can’t manipulate at all but most tiles allow you to either rotate, flip or slide them which allows you to change the path that the Molecats walk on. Your goal is to guide the Molecats through the levels gathering more Molecats, mushrooms, helpful items, and finding secret areas before eventually ending up at the exit. So I will apologize if that description of Molecats’ gameplay was a little confusing. Unfortunately Molecats is one of those games that is not particularly easy to describe. I have played a lot of different video games and yet I have never played anything quite like Molecats. I think the best way to describe the game is that it is Lemmings where you manipulate the environment instead of the creatures themselves. Basically Molecats’ gameplay is something that you have to play in order to fully appreciate. While Molecats’ premise really interested me, one thing that made me a little cautious is that the game kind of looks like it was made for children. The game’s art style looked kind of kiddie and I worried that the gameplay wasn’t going to be all that challenging. At first this assessment was correct. The first levels in the game were pretty easy. For the first world (there are five total) the levels were pretty straightforward. This is mostly because the levels are used to help teach players the mechanics of the game. The gameplay is pretty straightforward as you mostly just have to figure out how to create a path from the start to the end. Molecats might start pretty simple but that doesn’t last. I wouldn’t say that Molecats ever becomes frustrating but I wouldn’t say that it is an easy game either. The game’s mechanics are pretty simple but the designers did a really good job maximizing them to create some truly challenging puzzles. To solve some of the puzzles you really have to think outside of the box. The difficulty is somewhat adjustable as you can decide whether you are going to just finish the levels or try to get all three stars. The game is quite a bit easier if you don’t try to get three stars in all of the levels. If you go for three stars though you will have your work cut out for you as you figure out how twist and turn the level’s tiles to get Molecats to parts of the level that you otherwise don’t have to visit. If you really want a challenge there are also bonus levels that will test you even more. I would say most of the earlier levels will take you around 10 minutes but the later levels can take you around 15-20 minutes to solve. There are even some levels that can take 30-45 minutes to get three stars. You would think that puzzles that take 20 minutes or more to solve would become frustrating especially when you are unable to figure out how to get the Molecats to a specific part of the level. For some reason though Molecats succeeds in never becoming frustrating. I think this is due to a couple things. First the game’s puzzles are clever and thus you want to complete them. The level designers did a really good job coming up with different ways to use the game’s mechanics. The levels can be challenging but you feel a sense of satisfaction when you complete the more difficult puzzles. There is also the fact that outside of rare occurrences it is impossible to lose a level in Molecats. In the levels that I have played I think there was two times where it became impossible to beat a level. These were due to small glitches as the levels are designed in a way that you can’t lose them. If you are willing to put in the time you can get three stars in every level. While there are plants that eat the Molecats and creatures that scare them, there are items throughout the levels that can rectify these situations so you don’t have to worry about losing any of the Molecats. I found this reassuring as it otherwise would have been stressful trying to keep all of the Molecats safe. This is one thing that I didn’t really like about Lemmings as it was frustrating losing a level because you lost too many Lemmings due to one small mistake. You don’t have to worry about losing all of your progress due to one mistake in Molecats as all mistakes are reversible and a lot are quite easy to reverse. Being a big fan of puzzle games I really enjoyed my time with Molecats. I know the game is not going to be for everyone though. If you don’t like puzzle games it is obviously not going to be for you as no one is going to confuse it for anything other than a puzzle game. If you are looking for an easier/casual puzzle game Molecats may not be for you either as some of the puzzles can be quite challenging. If you want a moderately difficult/hard puzzle game I think Molecats is the game for you. While I haven’t finished the game yet, I definitely plan on finishing the game with three stars in all of the levels. Earlier on I briefly talked about the game’s artwork looking kiddie. That was not meant to be an insult as I actually think the game’s artwork is quite good. The style looks like something that was designed for a family audience but I think it brings a lot of charm to the game. The word charming actually does a good job describing the game as a whole. The only problem is that the game doesn’t have much of an actual story. I haven’t finished the game yet so the story might come together at the end but where I am currently in the game, the story makes little sense. The story is told through little comic like panels with no text or audio so you have to infer what is going on just by looking at the pictures. Maybe I missed something but I don’t really get the game’s story. You don’t really play this type of game for its story though so it is not that big of problem. One problem that I had with Molecats is that while the controls are usually pretty good, there are some times when they don’t do what you want them to do. I played the game using a keyboard as mouse as that seemed like the control scheme that would work best for this type of game. The game also has full controller support so my issues with the controls may not be prevalent if you use a controller. The controls are really straightforward and work well most of the time. I had occasional instances though when I had to click on a tile several times before it was finally selected. Tiles also occasionally rotated when I didn’t want them to. This is generally not that big of an issue as you can’t lose levels and it is usually really easy to correct any mistakes due to the controls. This is just one of those problems that occasionally annoyed me. I would say that the biggest issue I had with Molecats is that it is one of those games that get a little repetitive if you play it for too long. Basically it is a game that you want to play for around an hour each day and then do something else. As you are doing the same thing in each level, you will get a little sick of the gameplay after a while if you play it for too long. Molecats is more of a game that you want to pace out instead of playing all at once. I think the best way to approach the game is solve a couple puzzles each day. This will allow the experience to last longer and will allow you to fully appreciate the game. Speaking of finishing the game, I unfortunately can’t give you a definitive length for the game. Currently I am just starting the fourth world (five total) and I have been playing the game for around seven to eight hours. Assuming the later levels take longer I would say that I expect the game to take around 12-15 hours. This is factoring in going for three stars in each level as at this time I have gotten three stars in each level. If you are satisfied just completing each level I would say you could cut quite a bit of time off the game’s length. While I would obviously like for there to be more levels, this seems like a satisfactory length for an indie puzzle game especially since the game only retails for $12.99. 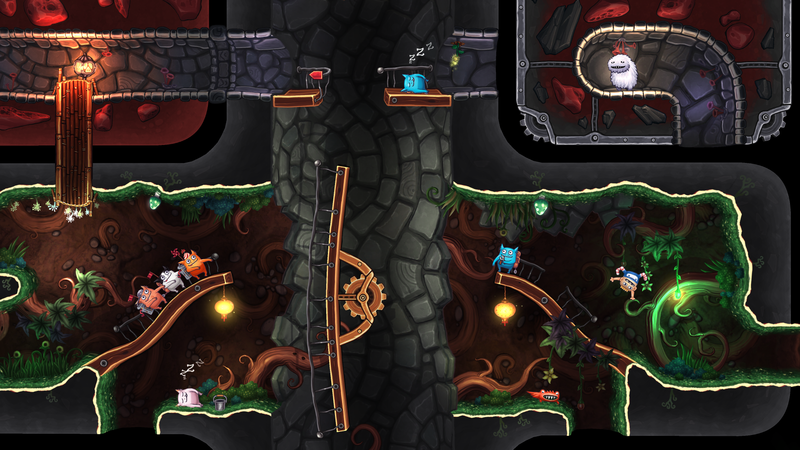 If you like puzzle games I think Molecats is well worth the asking price. I have been looking for a good Lemmings style indie game for quite some time and for the most part Molecats succeeds. The game does not play exactly the same as Lemmings as you are controlling the level itself instead of the characters but the game still brought me back to my time playing Lemmings as a kid. At first Molecats may look pretty easy but that doesn’t last. Molecats never becomes frustrating but some of the levels can be pretty challenging. You really have to think outside of the box from time to time in order to figure out what to do in some of the puzzles as the solutions can be pretty clever. I really enjoyed my time with Molecats. The only complaints I have with the game is that the story could have used some work, the controls act up from time to time and the game is more of something that you play for an hour or so each day instead of something you will play for hours at a time. If you don’t typically like puzzle games or the concept doesn’t really appeal to you, Molecats may not be for you. If Molecats’ concept sounds fun to you though I think you will really enjoy the game and I would highly recommending picking it up. A truly original puzzle game. The puzzles are creative and challenging and yet avoid being frustrating. Best played for around an hour at a time. The game's controls occasionally don't do what you want them to do.